You can get 100% bonus when you buy IHG Rewards Club Points until June 3, 2016. If you choose to buy the maximum number of points 60000, it will cost you US $690. And you'll end up getting 120,000 points. Note: Minimum purchase of 11,000 points. Manulife Bank’s Advantage Account Interest Offer of 2.50% is available to Manulife Bank’s personal non-registered Canadian dollar Advantage Account. Manulife Bank’s Advantage Account Interest Offer of 2.50% (Promotional Interest) is made up of the regular posted variable annual interest rate of 1.00% (Regular Rate) and the variable annual promotional rate of 1.50% (Promotional Rate). Any change to the Regular Rate will result in a corresponding change to the Promotional Interest. If you would like to take advantage of this offer and are not already the owner of an Eligible Account, Manulife Bank must receive and accept your application for an Eligible Account by June 15, 2016. Eligible Account holders can take advantage of this Offer by making a deposit to their Eligible Account from April 4, 2016 to June 15, 2016 (Eligible Deposit Period). Manulife Bank will pay the Promotional Interest on net new deposits (funds not currently held in a Manulife Bank account) made during the Eligible Deposit Period. You can deposit up to a cumulative total of $250,000 (Eligible Deposits) into your Eligible Account during that Period. The Promotional Interest will be paid on Eligible Deposits made during the Promotional Period – from April 4, 2016 to August 31, 2016. Note: Blackout dates and travel dates may vary by hotel partner. Have combined personal deposits and investments with HSBC Bank Canada and its subsidiaries of $25,000, or hold personal HSBC Bank Canada residential mortgage balances of $150,000 or greater within six months of the date of account opening. Note: The offer is only available in branch. The monthly fee for this HSBC Advance chequing account is $25. Or, you can keep $25K in deposits and avoid the monthly payments. If you are a TD Aeroplan Credit Cardholders, don’t miss out on this chance to stack up some serious miles! Make a purchase with your TD Aeroplan Credit Card at aircanada.com before Jun 26, 2016, and you’ll earn 5 Aeroplan Miles for every $1 spent. Online registration is needed with your Aeroplan number. 【Information provided by Lucas】Now, you can call Fido to add an additional data package (1GB) and you may get it FREE for your account for 1 year. This offer is targeted. Some one got 500MB, and some one got 2GB. All you need to do is to dial "611" from your mobile phone. Register by September 5, 2016. Stay at participating properties between May 24 and September 5, 2016, and you can earn 2,000 bonus points on every paid stay, starting with your second stay, up to 10,000 bonus points. And you can also receive an additional sweepstakes entry with every stay. Enter our sweeps when you register, and again with every night you stay: 100 members will win 100,000 points – for a total of 10 million points. Register now and stay between May 23 and August 28, 2016 and you can earn a $50 Best Western gift card for every two separate stays. Best Western Rewards members can also save 10% when booking direct on bestwestern.com and earn 1,000 rewards points for stays completed during the promotion period. Note: online registration is required. All $50 USD Best Western Travel Cards will expire on November 15, 2016. As a AmEx Starwood Preferred Guest Credit Card Member, you're invited to purchase Starpoints for 35% off now through June 3, 2016. Although this offer looks targeted to AmEx SPG cardholders, it is actually for everyone. No More AmEx Platinum Referral Bonus after Jun 29 ??? From the terms of AmEx Platinum: As the Basic Cardmember, refer a friend and you1 could earn a bonus of 25,000 Membership Rewards points for each approved referral up to a maximum annual referral bonus of 225,000 Membership Rewards points. To be eligible for this referral bonus, your friend must apply for the Card by June 29th 2016. We can still accept applications after this date but you may or may not be eligible for a bonus. So, it seems that AmEx will change their referral program on Jun 29. If you still have some referral for this card, please send it out soon. You can earn up to 30000 Asia Mile if you apply the RBC Cathay Pacific Visa Platinum card before Jul 15. You'll get 15,000 miles upon approval and then you have to spend $7,500 in the first three months to receive the additional 15,000 miles. Apply a TD credit card (see pic below) within 14 days of opening your chequing account and spend $500 with the Card by October 17, 2016. 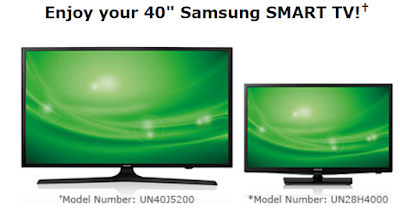 NOTE: If you only want a TD unlimited transaction chequing account, you’re eligible for a Samsung 28” HDTV. You can get up to a $1,000 cashback when you open a new bank account package with National Bank from May 16 to August 15, 2016. Visit a participating branch to open two bank accounts and sign up for the Virtuoso package. By October 17, 2016, both of you sign up for and carry out a salary deposit or any other recurring direct deposit to your new accounts; OR by October 17, 2016, both of you make two bill payments (preauthorized debits or bill payments via our electronic banking solutions) using your new accounts. Both of you sign up for online statements for your new bank account by October 17, 2016. Both of you apply for a National Bank MasterCard credit card and activate it by October 17, 2016. Open at least one youth account (First Step1, CoolCash, i.d. ), student account (ClickStudent) or RESP for your child residing at the same address. Visit a branch to open a bank account and sign up for the Virtuoso package. By October 17, 2016, sign up for and carry out a salary deposit or any other recurring direct deposit to your new account; OR by October 17, 2016, make two bill payments (preauthorized debits or bill payments via our electronic banking solutions) using your new account. Sign up for online statements for your new bank account by October 17, 2016. Apply for a National Bank MasterCard credit card and activate it by October 17, 2016. Note: To have access to these offers, you must commit to keeping these eligible products and services with no changes for a minimum of 24 months. If you do not meet this condition, you will have to refund the Bank an amount corresponding to the period where you did not keep your eligible products and services. When you convert your RBC Rewards points between May 16, 2016 and June 19, 2016, you can receive 15% more WestJet dollars. Not the best offer, but a good offer if need some Westjet dollars for traveling. WWF-Canada encourages Canadians to help address climate change by reducing their carbon footprint, including minimizing air and road travel, and choosing low-emissions transit. 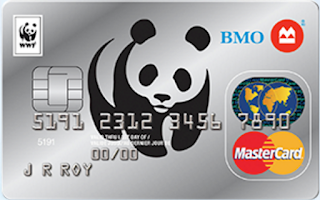 With BMO WWF Cashback MasterCard, you can help WWF-Canada in creating solutions to the most serious conservation challenges facing our planet, helping people and nature thrive -- at no additional cost to you. If you apply this card before June 9, 2016, you can get up to $75 welcome bonus. 2,500 CashBack bonus points ($25 in CashBack rewards) after your first card purchase . An additional 7,500 CashBack points ($75 in CashBack rewards) will be awarded when you spend $1,500 in net card purchases (less refunds and excluding cash advances, cash-like transactions and balance transfers) in the first three months from the account open date. If you cancel your card within thirty (30) days of opening your account, the Bonus points will be cancelled. 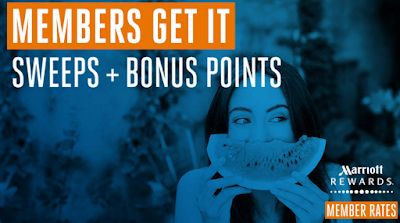 Now you can get 60,000 welcome bonus from MBNA Best Western Rewards MasterCard (please see the offer details above). This is the best welcome promotion for this card. Last time we saw this kind of offer was in 2013. From my point of view, this is a great offer. I already got one for myself: Thank you for your recent online credit application for a Best Western Rewards Platinum Plus MasterCard. This email confirms that your application has been approved, with a credit limit of 5000. You will receive your card in the mail within 10 to 15 business days, along with the terms and conditions. If you do not receive your card within this time frame, please notify us by calling 1-800-404-1319, quoting the Reference Number above. Claim: Add your offer to your PayPal account. Shop: Shop before May 14, 2016 at homedepot.ca. Pay: Checkout with PayPal. Your offer is automatically applied. Save: Savings will be listed in your PayPal email receipt and PayPal account transaction details. Discounted Esso gift cards are back on eBay. Now, you can get $100 Esso Gift Card for $90 with free shipping. Purchase limit (5) per eBay User ID. Don't forget GCR. You can get extra 1% cash back from GCR on ebay purchases: 1% cash back on ALL gift cards, gas cards, ecards, egift cards or any cash cards. I just bought 2 for myself. 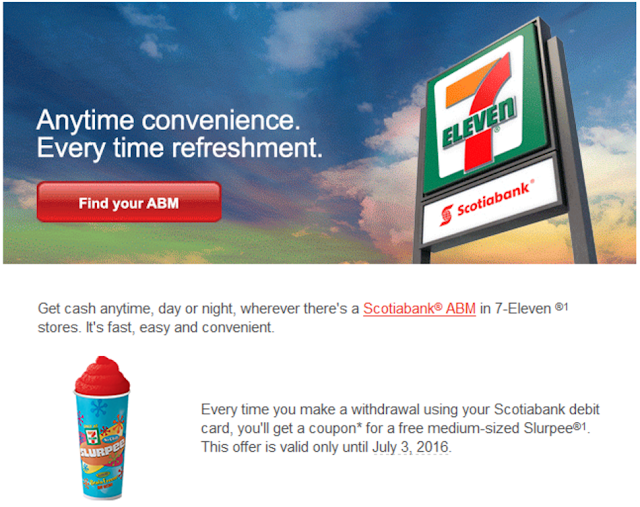 You can get a free medium-sized Slurpee when you make a withdrawal using your Scotiabank debit card from a Scotiabank ABM in 7-Eleven stores. 2) Set up two (2) Pre-Authorized Payments, such as a pre authorized bill payment to a service provider or pre-authorized contribution to your investment account, from your new Eligible Personal Banking Account. Both Pre-Authorized Payments must be debited and must clear from your new Eligible Personal Banking Account by end of day Oct 30th, 2016. Offer valid between May 3 and June 7, 2016 only at participating Irving Oil locations. No coupon required. AIR MILES Card must be presented at time of purchase. 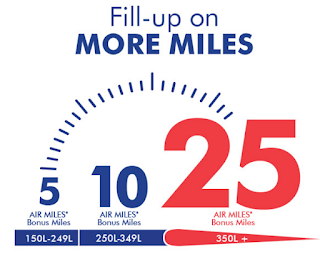 Bonus will be calculated on the total number of litres purchased (all fuel types) during the promotional period to a limit of 25 AIR MILES Bonus Miles. 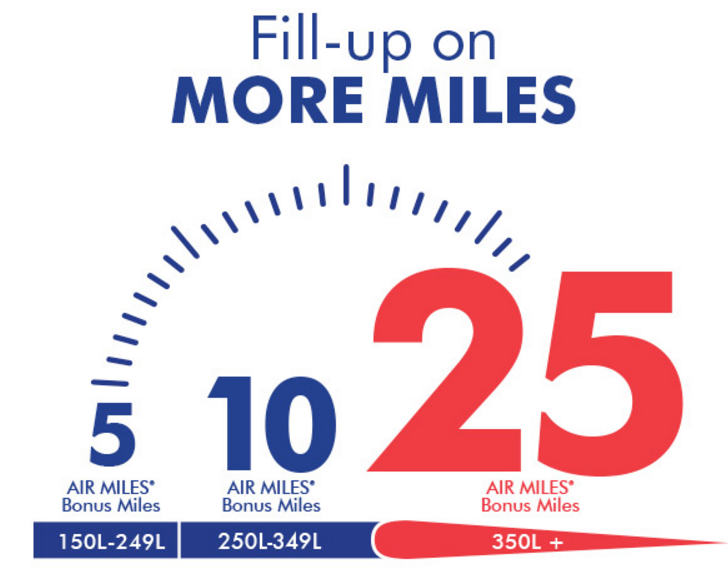 There is a limit of one (1) Bonus Offer per AIR MILES Collector Account during promotional period. Enjoy this exclusive Gift Cards offer: Surprise someone with an Amazon.ca Gift Card, and get a $10 promotional code to spend on yourself. Just purchase at least $50 in Amazon.ca Gift Cards in a single order by May 31, 2016, and receive a $10 promotional credit automatically applied to your account after the qualifying order has shipped. An email notification will also be sent within three (3) days after shipping, confirming your Amazon.ca Promotional Credit. Enter "0516GIFTCA" at checkout to qualify. A perfect present for any occasion, Amazon.ca Gift Cards can be sent via email, printed at home, or sent through the mail. Amazon.ca Gift Cards are redeemable store-wide for millions of items and never expire. Scroll down to learn how to use your promotional code. Terms and conditions apply; scroll down to learn more. 0% annual interest rate (AIR) on balance transfers for the first 6 months. BTW, if you don't have a GCR account, you can use our referral link ( https://www.greatcanadianrebates.ca/Register/126795/ ), with which you can get extra $2.5 from GCR (and we can get bonus too. Our email is: canadianrewards@gmail.com). We appreciate you using our links where possible. You can earn Double Points when you sign up and stay at any hotel between May 1 and August 31, 2016. There's no limit to how many Points you can earn. Online registration is required.